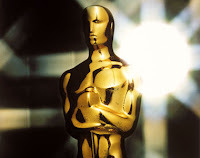 Your friends Count Vardulon and The Divemistress have been invited to participate in VoucherCodes' Oscar Sweepstakes. VoucherCodes is a money-saving website out of London, and they offer loads of coupons. As you can imagine, a fair bit of money is up for grabs, so The Count and The DM put their heads together and came up with the picks below. We'll find out soon if the two are really as smart as they claim. Meantime, take a gander at the competition.